Olympia Cycle & Ski: Giant XTC 24"
We're happy with whatever gets kids out and riding (as long as it's in decent shape and safe) so we're happy for those who like 'boys' and 'girls' bikes with gender specific blue and pink themes because they're not hard to find. However, we also know that some kids don't want a boys or a girls bike - they just want a bike! Preferably one that looks like their parent's or older sibling's bike - essentially a 'real' adult bike made a bit smaller. Enter the Giant XTR 24". 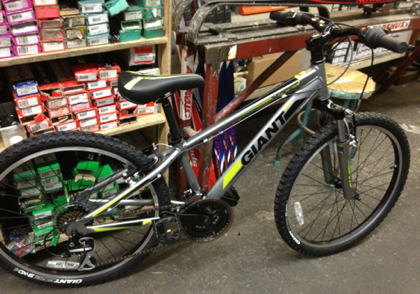 24 refers to the wheel size which is a bit smaller than the standard 26" adult mountain bike size. The frame of the bike has of course been scaled down to match the wheel size. Some of the parts on the bike are a bit heavier than the adult XTC versions in order to keep the cost down but overall it's a good package that comes at a very reasonable cost of $390. Just like with all of our adult bikes if you purchase this one you also get a free tune up after the 1st month (during which time the cables will likely stretch a bit as you break in the bike) and again after the 1st year of riding. And just like all of our adult bikes this one is put together by our pro mechanics and set up to fit your child properly by our exceptionally experienced staff.